I live in Alaska & backpack/hike all over the state when I can. I just found out about this website, but I wish I found this existed long ago as I've been on some amazing hikes & would've hid stuff long ago. I will be hiding fun caches worth finding very soon. Greetings from Wisconsin! We had our first geocaching adventure as a family over the weekend and are excited to get more involved! Hi everyone! I'm Beezy, I'm from San Antonio, TX. I first learned about this when someone I knew in high school told me about it and took me along to find one in our neighborhood out in Canyon Lake. I only found a few back then in 2013-14 and didn't get much into it. But I recently had some family visiting and used geocaching to keep us outside, and now I can't stop lol. Can't wait to get more into it! Hi everyone! I'm Beezy, I'm from San Antonio, TX. Only just found out about this wonderful activity and can't wait to really get going! Greetings, My wife and I make up Team Rogersway. we got into caching three years ago. We had to lay off for about a year because of family duties. we got our kids involved and they took off. NOW, we are back. We have to at least catch up with the kids number of finds ! ! ! my question is, HOW DO YOU PUT ON A MEET AND GREET? there are a lot of cachers here in the Kingman Az area but unless you meet by chance at the same cache its hard to meet anybody. Thanks. we're having a great time going out and Caching! we even take our Miniature Schnauzer with us.. looking forward to meeting more cachers. HOW DO YOU PUT ON A MEET AND GREET? First choose a suitable venue and date... then use this page. Scroll to the bottom and select Create a new Event Cache. Hi All. Brand new here (haven’t found a single cache yet), but the whole concept is so cool i am now after my first one. Anyway, I’m Brazilian but now living in Berkshire, UK. If anyone wants to talk that’s nearby, give me a shout! New guy here, Mark in Louisiana. My 8 year old daughter recently read something about geocaching and asked if we could do it. I ordered a Garmin GPS and we will hunt for our first geocache this coming weekend. Hello, I just started Geocaching like yesterday. I originally first heard about geocaching at a booth in Port Allegany Pa Festival at the park. That was about ten years ago. I needed a hobby that got me out doors that would be entertaining and I would get to interact with people. Used a GPS to log bluebird nest locations at a local park, and it sparked my interest. I live in PA, and am a 52 year old female. Ex military. New guy here, Mark in Louisiana. Hello, I just started Geocaching like yesterday. Hi, we're a family of 4 from Scotland. We found our first geocache by accident while on holiday last week, and our 2 boys were instantly hooked! I (dad) tried to get the family into geocaching a few years ago so I'm delighted that it's proving popular with them now. We've already found a few local to us, once we've got all of the caches within walking distance we'll be heading further afield. Hi I’m new to geocaching and am starting out as a Premium member. I live in the US and split my time between south Florida and the Lake Erie islands (Ohio) in the summer. My brother was visiting me at my summer home and we had planned a day on the mainland. He stumbled across a reference to geocaching in a book and we decided to try it. We had such a great adventure and were immediately hooked. He is retired and lives in VA so I expect he will outlog me quickly. I work remotely with occasional travel so I hope to pick up some diverse cache locations when I travel for business. Hi, we're a family of 4 from Scotland. Be so very welcome scotts! Hello I started this yesterday with my son as a chance for us to get out of the house and do something new and spend some nice time together. We found four yesterday and thought that we would have more success today but man we must have searched 10 spots only found two. And they were the easiest to that you can find. Trying not to get discouraged but I figure we're trying too hard so we'll take a break from it. But it's a really really nice way for a family to spend time together, get the kids outside and go explore some places we've never been. Today we went into a cemetery from the 1850s and I enjoyed having a conversation with my 11 year old about the dates in history. Be very welcome you both! Brand new to geocaching, ex wanted to do it with our son and I was on board! We've yet to come up with a team name but we will I've learned a lot reading the FAQs and forum submissions here. Love it. Been supplementing with a bit of YouTube so my son (he's 9) can follow along easier. Kids these days I live in New England and there are a lot of trails and public land around here which I think should be most helpful. The downside is that when it's -15F I'm not sure I want to go out and about so I think our season might be pretty short. At least for my family. Anyway, just wanted to say hi, I'm sure you'll see some posts from me in the other areas! Hello, I am a guy from Czech Republic who is just getting hooked. Recently Czech Radio's main channel ran a hour long interview with a well known geocacher (complete with a finding a cache on the site of the first radio broadcast). This prompted me to check my local area and I found out there's a microcache less than hundred metres from my place. So I signed up on GC.com and went to find it. And from there it seems to be going downhill... I love to go out for long walks outside, so geocaching seems perfect to me. We'll see, so far 4 caches found and going for another one on my lunch break. I'm a somewhat avid hiker/backpacker based in Michigan and believe it or not just ran across my first geocache on accident this weekend. I went off trail looking for a bit more of an adventure that I was having and thought I ran across a car battery buried under some brush ... I signed the log, left something and took something as per the included instructions and decided this might be something fun to add to my time outdoors! I'm excited to see what this is all about! I'm a somewhat avid hiker/backpacker based in Michigan and believe it or not just ran across my first geocache on accident this weekend. Hello from Dallas/Fort Worth area. New to this hobby. Looking for an excuse to do a little bit more urban hiking. Hey guys, my name is Jay and I'm from Hamilton, Ontario. I only just started checking out geocaching last week and am excited to try it out a little bit more! Would love to try it out with other people as well, so feel free to shoot me a message if you're in the area! New to this hobby. Looking for an excuse to do a little bit more urban hiking. Nous débutons cette aventure aujourd'hui aux Arcs sur Argens, je suis une maman avec son grand garçon de 10 ans et nous adorons le principe de geocaching ! Notre sac est rempli de petites choses à échanger et nous espérons trouver quelques boites ! Hi, everyone... I'm Charles. Some friends call me Chuckwagon, hence the username. And the 704 part is the Charlotte, NC area code where I was born, raised, and currently live. I've been geocaching for a little over a month-ish now, and can honestly say that I haven't this much fun in a very long time. I'm usually out by myself when I'm caching because I work on the road with a group of muggles doing TV broadcast work for NASCAR, but when i'm home, my girlfriend will usually come with me. I JUST went premium last night, and JUST discovered the forums here recently, and I confess to being a bit of a lurker until now. 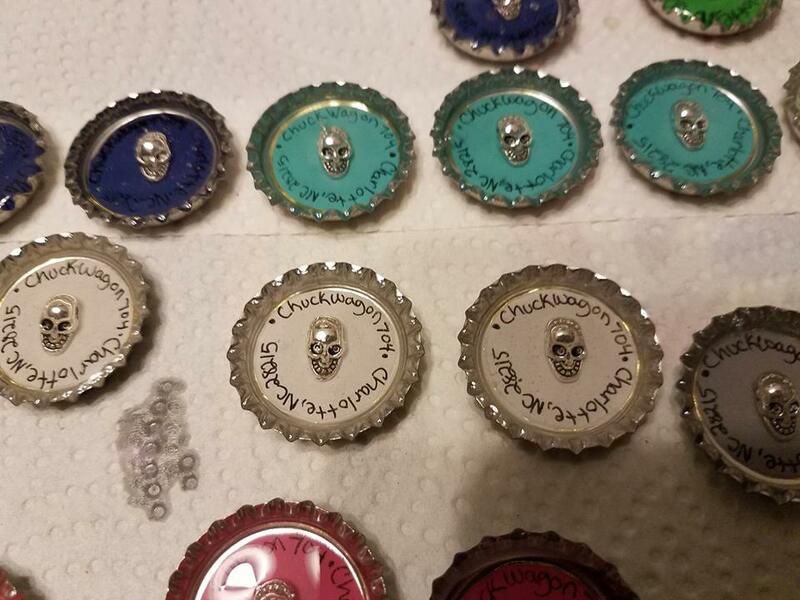 I have also made some "signature swag" pieces, using bottle caps and resin with little skull charms encased inside, that I have been dropping at locations with containers large enough to hold them (pic attached). When logging the cache, I always encourage people to keep them or use them as trade for their next cache if they decide to take it. Hey there fellow cachers, I'm Deb, and I've got the geocaching bug. I used geocaching as a Grandma Camp activity in June and July (we had two grandma camps, one in Ohio and one in Montana!) (16 kids!) I go to Missoula MT and Farmington Utah frequently to visit kids and do some caching there, but mostly I borrow some grandkids that live nearby, we call ourselves the Diamond Hunters-- and we're on a roll. I have Ava (8) and Abby (11) and they both have Eagle Eyes! I am so proud of all they are learning by doing this game. We just hid our first two caches after hitting 50 finds. We've got a bunch more planned. What a fun activity-- gets us all off the couch and away from our screens-- well, somewhat! It's a different kind of screen, right? Hope to see you around. Hi my name is Liz and i have just started this new hobby ! Good evening all from Centennial, CO. I just started geocaching a few days ago with my daughters. I'm really looking forward to where this will lead to. I'm also looking forward to being able to set out my own caches someday. Good evening all from Centennial, CO. I just started geocaching a few days ago with my daughters. Hi my name is Jorge. Cheers from Spain! Starting to geocaching with my 9 and 6 years old daughters. Hi my name is Jorge. Just heard of this today for the first time. My husband and I are self-employed and I am a homeschool Mom/Teacher of 3. We have already been doing things like metal detecting and magnet fishing as a family. This will just add to our times out hunting for treasure.